Bonhomme Richards, a wasp class battleship with more relief assist hardware and supported by up to 1000 U.S marines, which was to be sent to Sri Lanka, was later diverted to Sumatra where it was determined that more help was required. The Duluth, whose home port is San Diego, California, belongs to the Amphibious Transport Dock class of ships, designed to transport landing forces for a variety of missions, including humanitarian aid. The Duluth is carrying three CH-46E Sea Knight Helicopters, engineering and earthmoving equipment and over one hundred Marine personnel. The ship is also carrying a landing craft capable of carrying 180 tons of equipment, which will be used in supporting the aid mission. The Duluth will lay off the coast of Galle for approximately one week before continuing on its course. 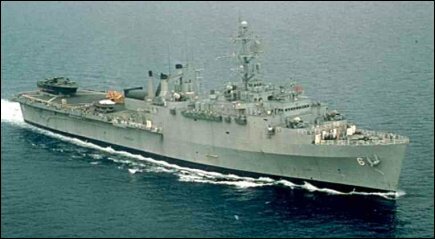 An Austin-class ship, the Duluth is 173.4 meters long, and was commissioned on December 18, 1966. The Duluth is part of the Navy's Expeditionary Strike Group-Five.